...but usually I get called Spenny. I grew up in Toronto, studied computer science at Carleton University in Ottawa, then moved back to Toronto and joined its vibrant game development scene. I love playing games. I love making games. My interest in game development was catalyzed by two games, The Sims and Half-Life 2. The Sims taught me about game modification, leading me to learn how to add my own furniture objects to the game. Half-Life 2 got me access to the Source engine modification community, where I pursued hobbyist environment art and level design. Knowing I wanted to make a career of game development, I enrolled Carleton University's Computer Science Game Development stream. Through me coursework I learned the skills that helped me start working in the industry and through group projects I learned that I love collaborating to make games. Working with other talented individuals to make great games is the reward I'm given daily working in game development. My love for games doesn't end with playing and making video games, I'm a hobbyist collector of retro games and an avid player of board and table top games. 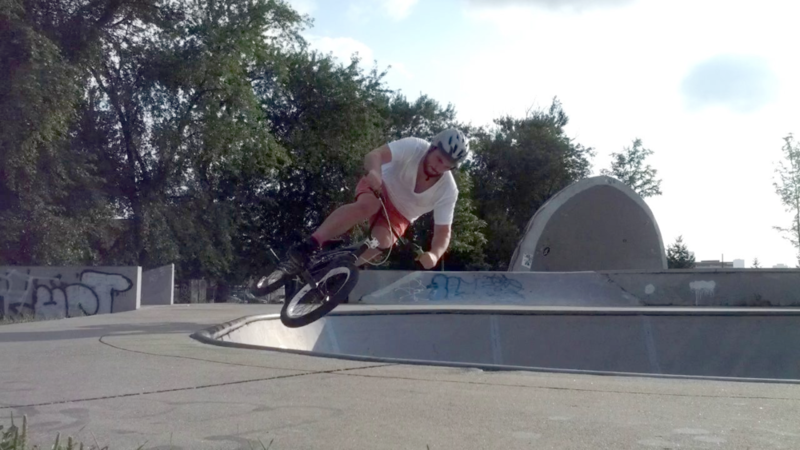 Catching some air on my BMX. I'm committed to learning and growth. I'm always pushing myself to learn new things and find new ways to be creative. Recently I've been pushing myself to participate in game jams and do game development outside of my professional work. I've been an organizer and moderator for Wizard Jam, the Idle Thumbs community game jam. Recently, I've rekindled a love of building with Lego, giving myself a nostalgic and creative pastime. You can see my creations here. I'm an aficionado of craft beer and an enthusiast for dinosaurs. Great Lakes' Canuck and Parasaurolophus are my favourites respectively. I'm also pretty good at trivia.